Captioning Assistive Listening System, Video Captioning, Language Translation Devices. Changes Changed name from Countdown to Extinction to Dinosaur on May 18 2000. The ride was phenomenal. OMG. I went on a total of 10 times!! The ride is not scary so don't be afraid to ride. It's Dinoriffic!!! Best ride. Not in animal kingdom. Not in disney world. Not even in Florida. Just best ride. Period. Located in Dinoland USA, Dinosaur is a thrilling adventure through time back to the age of the Dinosaur. Combining an advanced Enhanced Motion Vehicle (EMV) and huge Audio Animatronic figures, it's one of Animal Kingdom's original thrill rides, and something not to be missed. 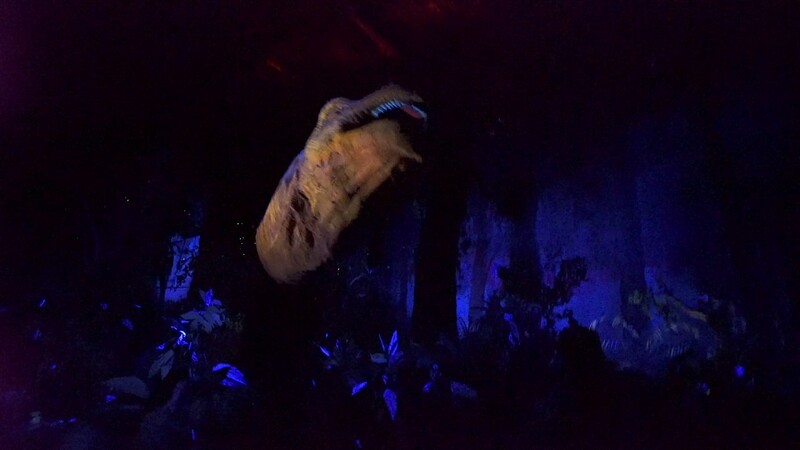 Extraordinary dinosaurs stalk vast primeval forests of 65 million years ago in Countdown to Extinction, a heart-pounding high-speed adventure at Disney's Animal Kingdom, the newest theme park at Walt Disney World Resort. With a fiery asteroid powerful enough to wipe out life on earth speeding closer and closer, time travelers board vehicles that tilt, turn, twist, bump and careen through a dark prehistoric forest inhabited by living, breathing dinosaurs. Countdown to Extinction anchors DinoLand U.S.A. -- a land devoted to the fascination and drama of the Age of Dinosaurs. As the story goes, Countdown to Extinction is a "once-secret research facility" of The Dino Institute, "built to serve as a discovery center and on-going research lab dedicated to uncovering the mysteries of the past." Guests first enter the institute's open-air rotunda, brimming with murals, dioramas and fossils depicting one of the most startling chapters in the history of the world . . . when dinosaurs became extinct. A dramatic multimedia show explains that scientists now believe a fiery asteroid six miles across and traveling 60,000 miles per hour slammed into the earth, creating a "nuclear winter" that devastated plant life, and ultimately, dinosaur life. Guests then enter the CTX Briefing Room, where they meet Institute Director Dr. Helen Marsh via a "live" video conference. "I hope you enjoyed the quaint exhibits in the old wing," Dr. Marsh tells guests. "Today, that bare bones approach is history. In a perfect blending of science and technology, The Dino Institute has created The Time Rover -- an amazing vehicle that can literally transport you to the Age of the Dinosaurs." A tug-of-war discourse between Dr. Marsh and paleontologist Grant Seeker, who will guide guests through the trans-dimensional joyride, reveals that Dr. Marsh and Seeker have different intentions for their enlisted guests. Dr. Marsh says she wishes to provide guests with a breathtaking -- but peaceful -- journey through a prehistoric world of spectacular creatures. Dr. Seeker, however, secretly plans to whisk guests perilously close to the fiery end of the Cretaceous period to find and return with an iguanodon dinosaur. Entering the load area, passive displays have given way to a futuristic industrial-themed tunnel, where lights pulse and mammoth machines pump tons of energy overhead through massive pipes that power the time-travel technology. Underneath, guests board the 12-passenger, all-terrain time rover. 5 million . . . 10 million . . . 20 million . . . 40 million . . . 60 million . . . 65 million years. Guests emerge into a sunless prehistoric forest filled with flurries of fluttering insects. Via the vehicle's time-linked radio, Dr. Seeker guides guests through a pastoral landscape occupied by peaceful dinosaurs. The honking and shrieking of prehistoric animals can be heard for miles around. Just ahead, the rover's headlights shed light on a pack of styracosaurus. As the rover climbs slowly uphill, a sweeping panorama of a dense forest populated by a variety of dinosaurs unfolds. Suddenly, meteors begin streaking across the sky. Three minutes ‘till The Big One! Nearby, an alioramous dines on a giant lizard whose tail flails about, even though the bulk of its body has already been consumed. Suddenly, a hail of small meteors spun off by the approaching asteroid strikes the vehicle, darkening its headlights. Sparks fly as it is rocked off the path, sending guests careening off course and plunging recklessly downhill into a dark, untested jungle. Bamm! The vehicle slams into something and jolts to a sudden stop. It's a monstrous, meat-eating carnotaurus! The rover peels out from under the dinosaur's wretched claws and giant jaws, and onto a crunchy bed of jungle. The horned carnivore thunders through the brush in pursuit. Accelerating into the darkness, the rover begins to bounce up and down across a rocky terrain. The sounds of the jungle swell, but the heart-thumping howls of the carnotaurus are falling off into the distance. A draining sound indicates that the rover's power levels are falling fast. Lightning and meteor showers intensify. Swerving to miss a nest of baby pterodactyls, the vehicle cranks to the right, fishtails and spins wildly out of control. Momma pterodactyl -- her wings spread to their full span -- swoops down from out of the blackness above, letting out an enraged squawk. The ground suddenly gives way, and the rover bounces down a steep, rocky incline. Rocks clang on metal as spinning tires burrow into the ground, spitting gravel everywhere. A scampering of smallish dinosaurs leap overhead. The rover whips around a corner at high speed and plunges into total darkness. Alongside, the brush is crushed beneath an incredible force . . . carnotaurus is back! Thirty seconds to a fiery extinction! The rampaging beast uproots the forest around the vehicle. Heat pours from his flaring nostrils as his tail lashes excitedly from side to side. Carnotaurus is inching closer and closer. Just then, a massive meteor strikes near the attacking nemesis, sending a rippling earthquake in all directions. Ahead, guests see an iguanodon standing aside a splintered tree trunk. A victim of the daunting meteor shower, an impassable log has fallen and completely covers the path ahead. The vehicle is trapped. The sky turns white with a blinding flash! The massive asteroid has collided with the earth in a deafening bang! The sky deepens from white to yellow to orange, then, to red. A distant rumble builds, as blast waves begin to radiate out from the impact point. The force of the impact creates a tremendous vacuum, sucking everything forward. Trees are uprooted, rocks defy gravity. A howling wind whips everything toward the vortex. The vehicle, now sparkling in a mysterious way, trembles violently and rolls forward under power not its own. Where will it all lead -- to safe passage through the time portal back to the institute or the blackened vortex swallowing everything in sight?